The power of a well-designed window to draw in custom and set your store apart from your competitors isn’t to be underestimated. It should be part of your short term Christmas visual merchandising campaign. 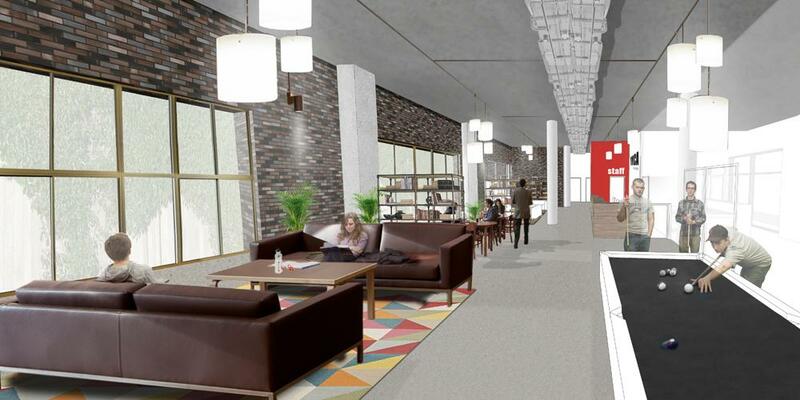 Here are some of the best, going well beyond LED lights and blinds and curtains! With Christmas fast approaching, we’ve identified what we consider to be the crème de la crème of Christmas window displays in London and New York. The likes of department stores such as Harrods, Selfridges, Macy’s and Bloomingdales, in particular, are notorious for their elaborate, outlandish and exciting Christmas retail window displays. Discover our pick of the best and, in the process, gain some inspiration for making your own window display stand out this Christmas. 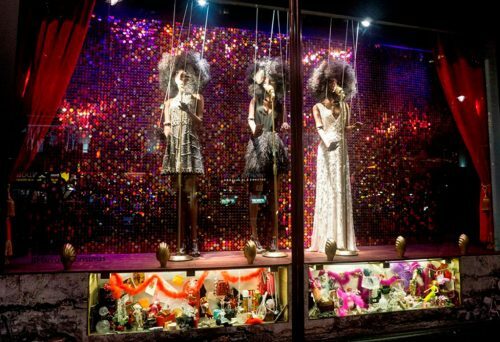 Last year, luxury Knightsbridge department store Harrods enlisted the help of Italian design duo Dolce and Gabbana for their Christmas window display. It was inspired by a ‘Once upon a time’ theme. Each of their 14 windows were adorned with moving puppets, mannequins, performers, bright lights and red velvet curtains. Their windows were raised by 60cm so that a magical underfloor scene, which consisted of Christmas mice wrapping presents and preparing for the festivities, was directly at a child’s eye level. Are there any adjustments you could make to your window dressing purely to attract the attention of a certain demographic? Harrods Christmas window display 2017, designed by Dulce & Gabbana. Selfridges are one of the few department stores in London to have unveiled their Christmas window display for 2018. In fact, revealing it way back in August! 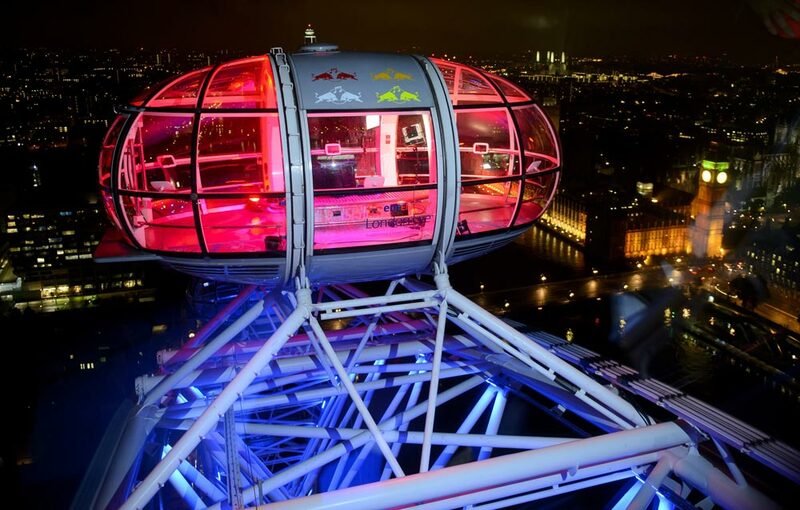 Their London, Manchester and Birmingham store now features more than 85,000 baubles hung from balconies and ceilings, and 200 Christmas trees. 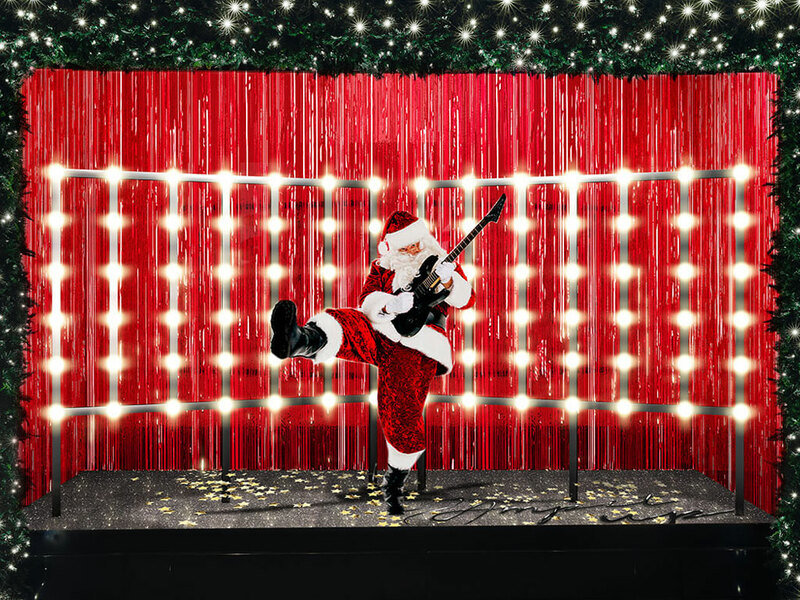 The ‘Selfridges Rock Christmas’ theme shows Santa dressed up in a variety of different rock outfits. A controversial suggestion but perhaps you could start the celebrations early too and be the first retailer on your high street to present a Christmas window display? No doubt, it will be a talking point and get you noticed! The iconic store on Regent street paid homage to the city of London in its 2017 Christmas window display. 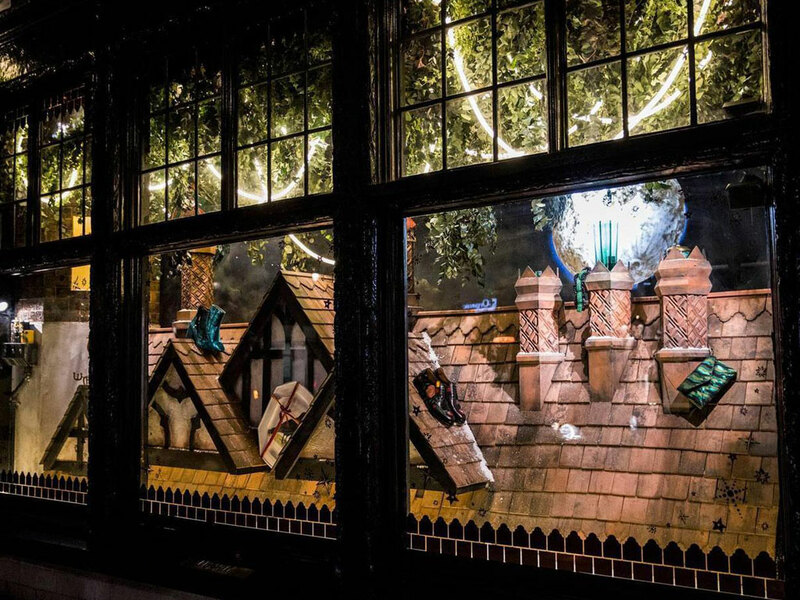 Liberty London drew inspiration from ‘Twas the Night Before Christmas’, their windows offer scenes of a London skyline, with a super-moon in the background and hanging foliage. For your Christmas window display, could you pay homage to the town or city where your store is located? It would certainly make for an interesting slant. Saks Fifth Avenue’s Christmas window display, last year, coincided with the 80th anniversary of the much loved fairy-tale, Snow White. With this in mind, passers-by were treated to Snow White themed fun in their 14 windows. Detailed pictures of Snow White frolicking among adorable woodland creatures, the seven dwarfs, the Evil Queen were on offer for all to see. Boarded with bright, colourful twinkling lights and garland, the stores Christmas window display was a continuation of a partnership with Disney which started earlier in the Summer months. Does your store have any interesting partnerships or collaborations that you could incorporate into your seasonal window display? 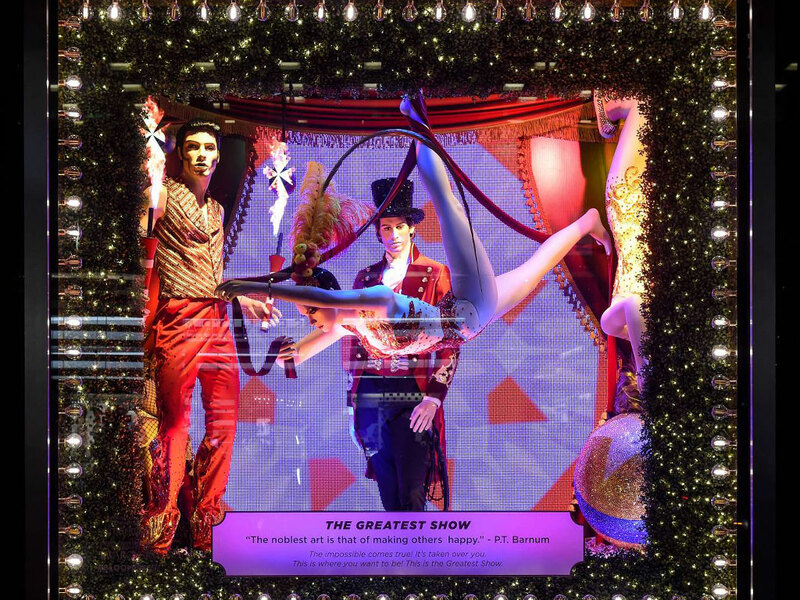 For 2017, Bloomingdales combined the release of ‘The Greatest Showman’ and a partnership with Swarovski to produce an impressive Christmas window display. Magical scenes from the film, plus costumes and props featured in the windows. Costumes were even embellished with more than 7,600, 000 Swarovski crystals. In addition to that, viewers were treated to an interactive experience and an optical illusion in the first window, titled “Showtime”. Behind two circus figures was a video wall, which transformed from a circus tent into peppermint-inspired effect. Passers-by could also become a part of the scene by pressing a button which projected their faces onto a screen inside of the set. 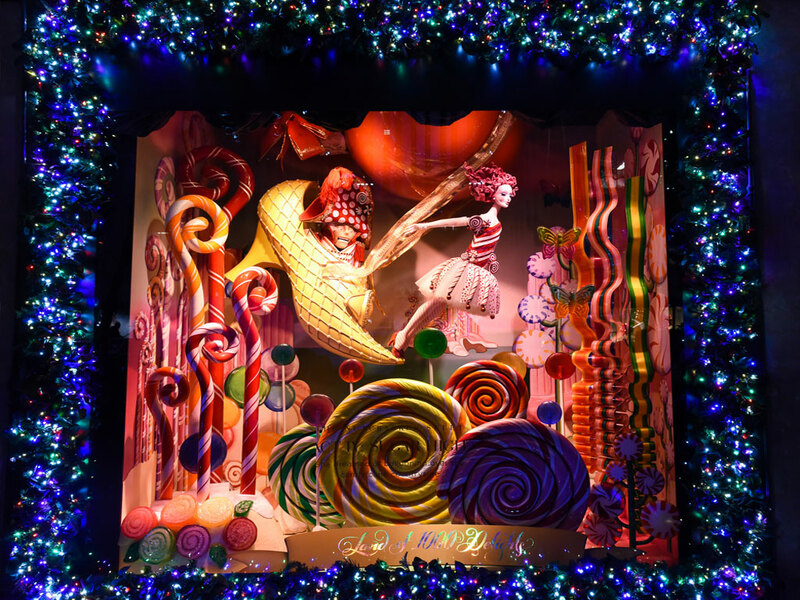 Food for thought – could your window display offer something interactive to garner people’s attention this Christmas? Have the above Christmas window displays got you feeling inspired? 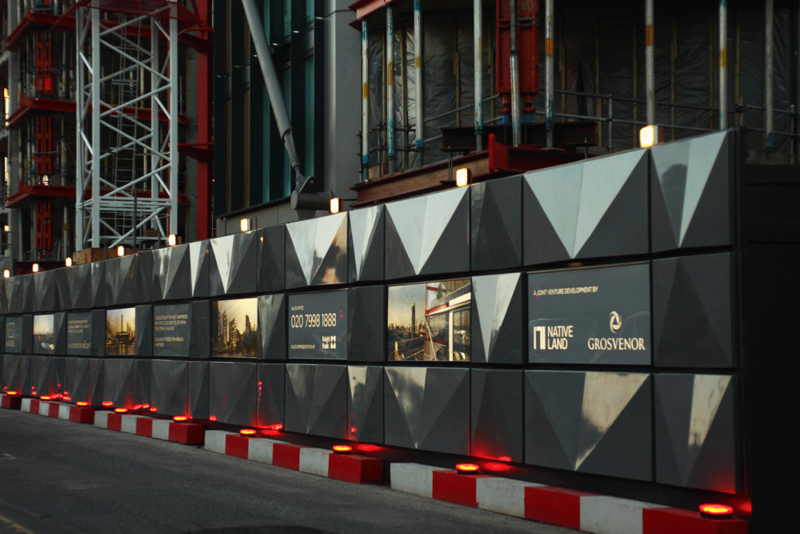 Get in contact with us today to discuss window display design ideas for your project. Regardless of the size of your shop or budget, here at Octink, we can design, create, deliver and install something truly spectacular for your storefront.